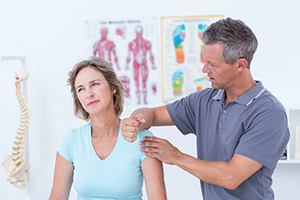 Shoulder problems are one of the more common issues that affect the musculoskeletal system, as its prevalence in the general population has been reported as high as 4.8%. The most common shoulder condition that causes pain is shoulder impingement syndrome (SIS), which often results from too much overhead activity. The first treatment option for SIS is typically physical therapy, which will likely include exercises and manual therapy, in which a physical therapist uses their hands to apply pressure and manipulate joints. Mobilization with movement (MWM) is one type of manual therapy that's been found to be beneficial in the short term; however, only a few studies have examined its effects on shoulder pain. Therefore, a powerful study called a randomized-controlled trial (RCT) was conducted to evaluate the impact of MWM on patients with SIS. Patients with shoulder pain for at least three months and a diagnosis of SIS were recruited, 42 of which were accepted and randomly assigned to either the MWM or sham therapy group. In the MWM group, a physical therapist performed a gliding movement of the shoulder while they applied pressure and moved the shoulder upwards, and tried to avoid pain while doing so. In the sham group, a similar procedure was performed, but the therapist's hands were positioned differently and they did not perform the actual treatment. Both were administered in three sets of 10 repetitions, and each intervention was applied twice a week for two weeks. All patients were evaluated for pain during various shoulder movements before and after the interventions. Results showed that patients in the MWM group experienced significantly greater reductions in pain intensity while performing the shoulder movements compared to the sham group. This was accomplished in only four sessions, in which MWM was the only intervention used. In most physical therapy programs, numerous interventions are often used, and it's therefore possible that combining MWM with other popular interventions may lead to even greater improvements. This RCT provides support for MWM as an effective treatment for SIS, and shows that it can lead to benefits in just a few brief sessions.